Sonia Gandhi, the head of India's governing Congress party, has been discharged from hospital just hours after being admitted, a doctor said. "She had a cold and a headache. We conducted tests... everything is normal," he added. Mrs Gandhi was taken to the hospital from parliament in the midst of the debate on the Food Security Bill after she complained of chest pains. In 2011, she had surgery in the US for an undisclosed medical condition. The 66-year-old Italian-born Mrs Gandhi is one of the country's most powerful politicians, the BBC's Sanjoy Majumder in Delhi says. She belongs to the influential Nehru-Gandhi dynasty, three of whose members have been Indian prime ministers, including her husband Rajiv Gandhi, who was assassinated in 1991. "She complained of a headache and she had a cough," news agency AFP quoted a doctor at Delhi's All India Institute of Medical Sciences (Aiims) hospital as saying. "We checked all her parameters. Once the team of doctors was convinced that she was all right, she was discharged." The doctors said Mrs Gandhi was released at about 03:00 India time [22:30 GMT]. On Monday, images flashed on national television showed her trembling while reading out a speech in parliament. Shortly afterwards, she was seen looking unsteady as close aides helped her leave for hospital. Her health and private life are closely guarded secrets but have been the subject of much speculation in India since 2011 when she visited the US for surgery. Mrs Gandhi holds no official post, but many consider her the de facto head of the government. 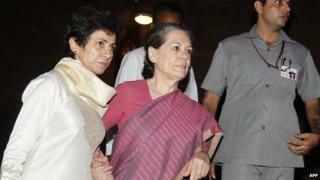 She nominated Manmohan Singh to the prime minister's post in 2004 and is widely believed to be more powerful than him. The powerful Nehru-Gandhi dynasty has governed India for most of the time since the country gained independence from British colonial rule in 1947.